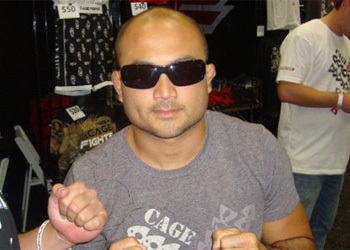 Immediately after hearing Nick Diaz’s bout against BJ Penn (Pictured) would become the featured attraction at UFC 137, Diaz’s longtime manger, Cesar Gracie, decided to up the stakes by challenging Penn to a five round affair. Although the Hawaiian has been preparing to fight a maximum of 15 minutes against Gracie’s star pupil, Penn claims he would have no qualms with going an additional two rounds despite the 11th hour notice. “Physically, I’d be very comfortable taking a five round fight,” Penn told 5thRound.com. “There’s nothing wrong with a main event being five rounds. Courtesy of Diaz’s triathlon-supported cardio, Gracie knows his protégé would have no issues with potentially competing another 10 minutes. Although Penn claims to have kicked his training up to unprecedented levels, his conditioning has always been his biggest question mark and Gracie is anxious to try and exploit his proposed weakness. When asked if he felt cornered into accepting a five round tango in order to deny Diaz any sort of mental edge heading into their October 29th shootout, Penn wasn’t as fazed by the challenge as much as he was by Gracie’s motives. “Cesar is a strange guy,” Penn stated. “I don’t know why he did that in the first place. I think, actually, Cesar should be the guy that should have to compensate me and not [UFC president Dana White]. UFC 137 takes place inside the Mandalay Bay Events Center in Las Vegas, Nevada. Their welterweight scrap headlines the pay-per-view broadcast, which is currently scheduled for three rounds.